Numerous emergency response agencies are considering alternatives to ambulances, one they can use for multi-casualty events. The bus is a new product for his small company (www.sartinservices.com), which also installs air conditioning in school buses and provides bus parts, custom interiors, special seating, and other services. Sartin discussed responders’ need for such vehicles in a Sept. 4 conversation with Occupational Health & Safety’s editor. Excerpts from the conversation follow. How did these Mobile Evacuation Buses come about? Ed Sartin: After Katrina hit the Gulf Coast, I was sitting there just like everybody else listening to the news reports. There was one report that caught my attention: that a nursing home down in either Mississippi or Louisiana was unable to be evacuated, and that all the patients in that nursing home died. That is what really got me thinking. I said, we’ve got to find some way we can get these people out. With the limited number of ambulances that are available, you just can’t send them everywhere they need to go—especially when you have one location where a lot of people have needs. Such as during a major catastrophe like Katrina. Sartin: It could be any kind of catastrophe— a subway accident, a plane accident, something like the bridge collapse up in Minnesota: some kind of situation where a lot of people are going to need immediate help. Some of the newest thinking coming out of government agencies these days is that, even at the large sporting events and any kind of heat-related activity that a lot of people are going to attend, such as an outdoor concert, this would be a great vehicle to use. Many cities hold marathons or road races where large numbers of runners participate. You might need the capability there. Sartin: The fire departments are very excited about it because they can bring their firemen in on a big fire, such as the forest fires they have out West, to rehab. You can give them something to drink, some oxygen if you want to. You can have them lie down. There’s a lot of interest in that particular area. Or you can take 20 buses in and evacuate a 400-bed hospital. Excellent points. The need for this kind of capability goes beyond what I had thought of initially. My quick list of past events where this was needed— Oklahoma City, the Northridge earthquake, Hurricane Katrina—now seems much too short. Sartin: Absolutely, just countless numbers of events. Any time you have a mass-casualty [situation]. In Washington, D.C., on I- 95, when they have a vehicle accident there that has six or more injuries, they’re sending this bus. . . . Instead of taking six ambulances or 10 ambulances and tying them up for the whole time, you take the bus and you can take care of all those patients or victims at the same time with one vehicle. Up to now, has it typically been done with individual ambulances, all massing at the scene? Sartin: Yes, it has. And all of those ambulances then have to go through a major cleanup after a victim—not necessarily after a patient, but after a victim they do have to go through a sterilization process. How expensive are the vehicles? Sartin: The ones that went into the Washington, D.C., area for the National Capital Region were in the $260,000 range. North Carolina buses on which we’re getting ready to receive the order—they’ve added all kinds of new things, including an intercom four-radio system so anybody on the whole bus can communicate with dispatch, automatic snow chains, all kinds of other important features so the caregivers will have the tools they need to properly help when they get on scene. And those buses will probably be in the low three hundreds. But, at the very most, I don’t think anybody could spend more than $320,000 or so on one of these. The Department of Defense, Homeland Security/FEMA, all the state agencies; we’re getting calls all the way from California to North Carolina. People are talking about putting these in regional zones. For example, there’s 24 regions in Texas; they’re talking about putting them in all of the regions. Louisiana and North Carolina are talking about the same thing so if there’s a hurricane or some disaster somewhere, they can bring them to a prestaging area and everybody can use their own vehicles for helping other people. I’ve already talked with Chicago, which has told me they’re going to order these. And it doesn’t have to be a major city. As you say, you can do something regionally, where there might be mutual aid, using them to serve more than just a metropolitan area. Talk about the access situation, please, where you have many ambulances converging on a scene and then going to a trauma center or centers, versus one or two of these trying to get in and also go to emergency medical care. How do these compare? Sartin: One of the big problems that you have with 15 ambulances responding to a scene is they tie up the scene. They park here, there, they have priority over everything. I’m not going to say you’re going to do away with ambulances, you’ll still have to have them, but in a mass casualty situation you can bring that bus in. The buses will go highway speeds. . . . It is very maneuverable, so you can get it in, get it out. Traffic wouldn’t be held up because it has all the lights and sirens just like a fire truck does. They would be manned and operated by fire personnel as a rule, right? Sartin: It is, generally, from what we’ve seen so far. All the buses up in the Washington area are in different counties up there, and they’re strategically located at the fire departments because they’re manned 24 hours a day and can respond at a second’s notice. Have they been used yet? Do you know how well they performed? Sartin: They have had some use; I don’t know which county it was. They had a large accident on the interstate up there, and [the bus] had responded to that and done exceptionally well, they told me. There were six or eight people seriously injur ed. What capabilities should this kind of vehicle have? Sartin: It depends on the needs of each individual agency. One of the key features to our bus is a stacked, sliding stretcher system. The whole stretcher assembly slides out into the aisle. 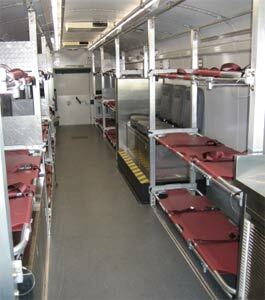 Two people could carry a gurney into the bus, set it in the stretcher’s tray assembly, [and] the assembly slides back to the wall and is locked into place. It’s vertically locked and horizontally locked so it can’t come out. The loading process is so simple that you could have 30 people lined up with 15 stretchers, and you could load that bus in four minutes. They consider these ALS, so we have individual metered oxygen for each and every patient. Something that North Carolina buses will have added to that: They want seven additional outlets just for special cases. . . . They want additional oxygen capability. There’s a good example of the kinds of customization one agency might want but another might not. Sartin: That’s correct. There’s the seating. And the North Carolina buses, as I told you, will have an intercom radio system for the eight attendants that will be in the bus. Each and every one of them will have a headset so they can talk on four different radios to dispatch, within the bus. It’s a very sophisticated communications system. They’re adding that. The first buses didn’t have that. It’s just the particular needs of the agency or the fire department or the EMS, or whoever it might be. That’s what we do: Each one is custom-built. It takes about 90 to 120 days to get a bus built. We’re starting another set, coming up at the end of this month to the first week of October, and then they’ll be rolling on. We’ve got a lot of orders that people are saying they’re getting ready to send us. If so, then we won’t be a small company next year.